Women are tackling the gentlemanly sport of fly fishing in increasing numbers, and their patience makes them perfect for it. "It's a disease" warned the owner of the Essential Fly Fisher in Launceston. “An obsession” sighed a lawyer in Brisbane. “More like possession” was the glum prediction of the bloke on the counter of the Alpine Angler in the Snowy Mountains. For all this the take up rate is stellar. Once a pastime of the landed gentry, now fly fishing is as close as your nearest tackle shop. Law and financial firms hire fly guides and lodges for weekends away with clients. Offering introductory courses, wine and food in abundance the corporate hunters fervently hope contracts are kept, renewed or new ones locked in. 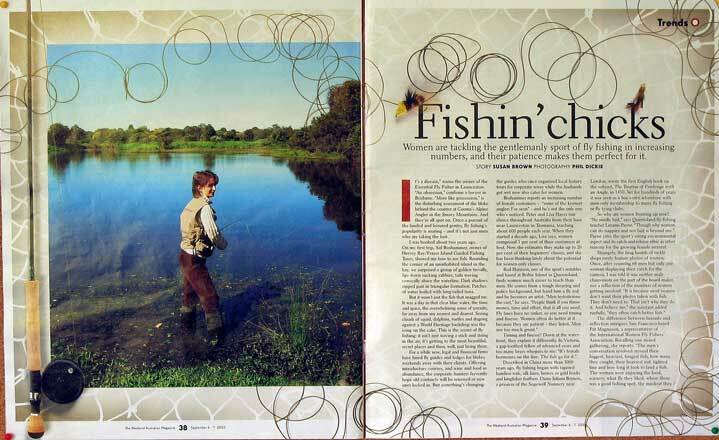 And while fly fishing is booming, the increasing number of women getting involved is grabbing attention. Guides that once organised local history tours to wives wanting a quiet weekend while their husbands got down and dirty in the reed bed now cater for women. Nurses needing to forget the job for a while frequent a Hobart tackle shop. I should declare an interest. I was hooked about two years ago. Writing articles about all sorts of worthy things, my mind wanders from the screen to the waters of some back country lake, hikes up a green river gushing over smooth rocks or peers into the Pacific after a tell tale swirl. On my first trip, Hervey Bay/Fraser Island Guided Fishing Tours owner Sid Boshammer showed me how to see fish. Rounding the corner of an uninhabited island we surprised a group of golden trevally, lips down sucking yabbies, tails waving comically above the water. Dark shadows of fish in triangular formation zipped past. Patches of water boiled with long tailed tuna. It wasn't just the fish that hooked me. It was a day in that clear blue water, far away from any nearest and dearest, seeing clouds of squid, dolphins, turtles and dugong all against a backdrop of World Heritage listed Fraser Island. Psst. It’s the secret of fly fishing. It isn't just waving a stick and string in the air, it is going to the most beautiful, secret places and, well, just being there. Boshammer reports an increasing number of female customers “some of the keenest anglers I've seen”. Rod Harrison, one of the sports notables, comes from a rough, tough shearing and NSW police background. Put a fly rod in his hand and he is an artist who finds women much easier to teach than men. Casting is the trick to fly fishing, and beginners now start with casting classes. Best known teachers are Peter and Lisa Hayes who run clinics throughout Australia teaching about 600 people per year. Lisa Hayes says when they started a decade ago, at most women would have made one percent of their customers. Now she estimates they make up 10-20% of their beginners classes. Hayes has been thinking lately about the growth potential for women only classes. Described in China more than 3,000 years ago flyfishing used tapered bamboo rods, silk lines, bronze or gold hooks and kingfisher feathers. Prioress of the Sopewell Nunnery, Dame Juliana Berners wrote the first English book, The Treatyse of Fysshynge wyth an Angle in 1450. But for hundreds of years it was seen as a boys own adventure with boys only membership to many fly fishing or fly tying clubs. So why are women now fronting up to fly fishing? "No smelly bait" laughs Queensland fly fishing teacher Leeann Payne. She pauses. "Though why women can do nappies and not bait is beyond me." Payne describes a strong environmental and catch and release ethic in fly fishing as another reason for increasing female momentum. Strangely, the brag boards of tackle shops rarely have photos of women. Inquiring after counting 66 men proudly holding various examples of fish biodiversity to one woman, I was told it was neither the gender based choice of the display board maker nor a reflection of the proportion of women going. “It is because most women don't want their photos taken with fish. They don't need to. That isn't why they do it. And believe me” the assistant continued ruefully “they often catch better fish”. Timing and finesse? Down at the waterfront it is reasoned out a different way. In Victoria, a gap toothed fellow of advanced years and too many beers whispered to me "it's female hormones on the line. The fish go for it". Costs of the gear range from affordable to mindblowing with rods advancing past cane to aerodynamic graphite and titanium numbers NASA would be proud to patent. Decent lines can go to the 3 figure mark. Taking up fly fishing once meant dressing down in mens sized gear. Columbia clothing representative Greig Smart told the Weekend Australian the company had been producing light weight, special purpose fishing gear for men for forty years. Since 1999, women’s lines have been appearing with standard greens and browns joined by colours like Red Ibis and Bahama Blue. Sales have been “going gangbusters”. “You'd be shooting yourself in the foot not to do a women's line these days” he says. Women need more than fast drying shorts and shirts, however. “If your shorts dry quick, fine, but if your underwear stays wet - how unpleasant,” said Maria Platz, owner of Tie 'N' Fly and importer of other US fishing clothes for women. Platz ,whose women's data base has gone from zero to 60 in the last three years and ranges from housewives to professors, stocks “jet dry knickers” and waders “with hips and a waist”. Platz is an organiser of the Australian chapter of Casting for Recovery, a US program which provides medically supported weekend retreats for women breast cancer patients. “The action of casting helps stimulate muscle repair and it is all done in beautiful surroundings.” She pauses. “Anyway you gotta be feeling better after 3 days of fishing”. Also on the Platz agenda is organising the first women's only fishing trip to Gulf of Carpentaria planned for next year. Women only packages are starting up down south too. Nicole Grose, who runs a guiding service with husband Neil on the Great Lake in Tasmania is starting women only fly fishing weekends. Apart from casting and fishing lessons, participants will sample Tasmanian gourmet wines and produce and be catered for by a mainland chef who will provide cooking classes. “Once women see it isn't the dirty old sport of fishing and see the romance of getting out into the fresh air, learning about their environment and catching trout they will realise it is just beautiful to be in the wilderness” Grose says. “Women have been the forgotten group”. It is a pastime which doesn't need to be put aside for pregnancy. Full term and wading in Bronte Lagoon Frances Latham knew it was one of her last trips before having children. “There was this expectation as I was casting to every shadow, movement and rise”. Suddenly a trout tugged on the line and she recalls her disbelief as her waters broke at the same time. She reeled in the fish, then caught another two on the way back to the car. “It was one of those magical moments,” she said. "What are you girls doing in our sport?" Harrison teased after trying to smooth my casts one day. "You used to be in the kitchen, it’s getting confusing". Jan Spencer knows. Her voice softens as she describes angular mountains, moss covered earth, century old pencil pines, cool clear streams and the way post card like memories of her wanderings can bring tears to her eyes. Fly patterns imitate six stages of insect life or baitfish behaviour. They are a mixture of fur, feathers, rubber and synthetic fibres tied to hooks to trick salt and fresh water fish. Presenting the fly and moving it in a natural way is the key. A good fly rod, preferably 4 or 5 piece for portability. Two good fly lines, one floating for dry flies, one sinking for subsurface presentation. A reasonable reel for each line. With your elbow by your side and wrist locked, move the rod back and forth over a short plane as few times as possible. The physics load weight onto the sinkerless line. If your technique and timing are right, the line shoots forward delivering the fly to the water in a natural looking state. Lessons, patience and practice. Why waste time? Learn to do it properly and avoid windscreen wiper syndrome. A trustworthy specialist fly fishing shop will help with gear, guides, places to go and lessons. Try books, guides, courses from TAFE or fly fishing shops and plan to take a couple of years to get up to speed. Subscribe to Fly Life quarterly for the dreamy places and up to date info. Anywhere fish frequent. Try Fraser Island, rivers and lakes in Tasmania, New Zealand, Alaska, the Rocky Mountains, the Bahamas, the Carribean or New Caledonia.